Stage Alliance ‘B Rate’ Is No More! On September 28th 2016, IATSE Local 205 members voted to accept this proposal. On October 1, 2016 all rated positions with the exception of ‘stagehands’, will receive the scheduled 1% pay increase. However, stagehands will now receive $17.25 for all work at Long Center’s Dell Hall and all venues of Texas Performing Arts. Eliminating the B stagehand wage rate is something Local 205 has pushed for during the last two contract negotiations, so we are very happy to finally see it gone! This change will remain in effect until the current contract expires on September 30, 2017. This entry was posted in 205 News, Contract News, News, Representation, Stage Alliance Inc. and tagged agreed, approved, b-rate, bargaining, freeze, rates, sa-inc-news, stage-alliance, wages on 09/29/2016 by 205admin. The shows listed below are the shows that were previously paid at the B wage, but have been reclassified to A wage as settlement of the arbitration between IATSE Local 205 and Stage Alliance. The list was determined by the criteria in the SA-LCPA contract that was in effect when we negotiated the current CBA with Stage Alliance. Ticket sales information was used to verify proper classification of the events. Note: The GMC event was a private corporate event with no tickets sold and a closed balcony, so it did not qualify as an A rate event by the criteria in the SA-LCPA contract. Make-up checks and healthy & annuity contributions have been made by Stage Alliance. If stagehands worked these shows and have not received a make-up check, they should contact a Local 205 steward or the Business Agent. This entry was posted in 205 News, News and tagged arbitration, sa-inc-news, settlement, stage-alliance on 09/26/2016 by 205admin. Union vs. Stage Alliance Wage Dispute Arbitration RESULT! 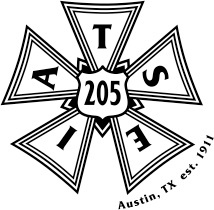 Although the arbitrator ruled that Stage Alliance did not fail to bargain with the Union and dismissed our unfair labor practice charge, the arbitrator also ruled that Stage Alliance did violate the collective bargaining agreement (CBA) when it unilaterally altered the show classification system at the Long Center. Furthermore, the arbitrator has ordered Stage Alliance to reinstate the show classification system for the life of the CBA as it was prior to the change made in September 2015. In addition, Stage Alliance shall “make whole” (pay the missing wages and health and annuity benefits) all of the stagehands who were not paid the appropriate Class A wage rate for shows that they worked at the Long Center since September 10, 2015. Per the arbitrator’s ruling, the Union will prepare a list of affected shows, as already detailed in Stage Alliance’s arbitration announcement. This positive result for Stage Alliance employees is the result of the hard work that Local 205 puts in to negotiating and enforcing our agreements. We could have gone to mediation or taken the compromise that was offered by Stage Alliance, but we listened when employees told us that they did not want to give up the wages that they were entitled to. In closing, I would like to take this opportunity to thank everyone who showed solidarity on this issue. This win is great news for our Local and for Stage Alliance employees alike. We are here to serve Austin’s stage employees by negotiating agreements with fair wages and conditions, and then by protecting those agreements. This is why IATSE Local 205 exists! This entry was posted in 205 News, E-Board News, News, President, Representation and tagged arbitration, conditions, labor-relations, representation, sa-inc-news, stage-alliance, wages on 08/10/2016 by President Magee. Attention all Stage Alliance Inc. Employees. Below is an update on the Stage Alliance Inc. wage dispute arbitration proceedings. Additionally we’ve created a handy page in the news section to catch all the Stage Alliance Inc. updates moving forward. The arbitration hearing between Stage Alliance and IATSE Local 205 took place on July 7, 2016. The arbitrator will issue her ruling within 30 days of the hearing date. The hearing was in connection with Local 205’s grievance regarding the reduction of A rate shows and the expansion of B rate shows at the Long Center for Performing Arts initiated in September 2015. Further to President Magee’s letter posted previously, please note that it has been determined that Frank Warren was a B rate show and is therefore not in dispute. Additionally, Local 205 is awaiting payroll information regarding Legend of Zelda and Mandy Patinkin to determine whether these shows will be included in the grievance. This entry was posted in 205 News, E-Board News, News, President, Representation and tagged arbitration, dispute, news, sa-inc-news, stage-alliance, wages on 07/16/2016 by 205admin. I am writing to update you on the ongoing dispute over stagehand wages at the Long Center for Performing Arts between IATSE Local 205 and Stage Alliance, Inc. An arbitration hearing will take place July 7-8, 2016 to rule on this dispute. The following details the events thus far. Since 2010, Stage Alliance has applied an A or B rate to shows performed at the Long Center. The A rate secured a wage of $17.00 p.h. and was typically applied to shows with ticket sales over a determined seating capacity. The B rate secured a wage of $15.75 p.h. It was applied to maintenance calls and shows that did not mean the A rate criteria. Each year, stagehands worked substantially more A rate hours than B rate hours. In 2014, the Union secured our first multi-year Agreement with Stage Alliance and our first wage increase in four years; a 25 cent increase on both the A and B rates increasing them to $17.25 p.h. and $16.00 p.h. respectively. However, in September 2015, Stage Alliance informed Local 205 that due to the signing of a new contract between Stage Alliance and the Long Center, the classification system was to change. Effective immediately, all shows would now be classified as B rate with the A rate only applying to Broadway shows, of which the Long Center has perhaps two per year. Or, the we could accept an offer of one flat rate for all shows performed on the Dell Stage of $16.60 p.h. As this is not what the Union had bargained for, and with $16.60 p.h. being far below our area standard for stagehand wages, we sought legal counsel and filed a grievance against Stage Alliance disputing the wage cut, and an unfair labor practice charge for not providing Union requested information and for making a unilateral change without first bargaining with the Union. Since my initial letter notifying you of this wage cut, there have been several meetings with Stage Alliance to try and resolve the dispute. During which time, it was revealed that the new contract between Stage Alliance and the Long Center, signed September 2015, no longer has A and B rates as originally presented to the Union. Rather, it has one mid point rate for all work on the Dell stage. As such, Stage Alliance has maintained it’s position that stagehands be paid one flat rate of $16.60 p.h. for all work performed on the Dell Stage. Local 205 has maintained the position that our Agreement, which was negotiated on the basis of past practice of the application of the A and B wage rates and the assurance that no future changes were anticipated, be honored. When a dispute remains unresolved, the grievance moves to arbitration. Arbitration is expensive. Stage Alliance asked if the Union would consider a cheaper, half day mediation prior to arbitration. Mediations are used to find solutions through compromise. A date was set last March for a mediation hearing and the Union held several meetings with Stage Alliance employees to determine what compromise, if any, stagehands would be willing to accept. Through these meetings, it became apparent that compromise was not palatable to the majority of affected stagehands and that what we all really want is for our wages to be reinstated as they were prior to September 2015. As such, mediation was put to one side and a date was set for arbitration. In May 2016, National Labor Relations Board reviewed our unfair labor practice charge. The board agent ruled against the union’s charge regarding withheld information. Prior to the ULP hearing, Stage Alliance had provided the requested information, namely a copy of the contract between Stage Alliance and the Long Center. The part regarding the failure to bargain is being deferred to the arbitration hearing. Frank Warren, Ballet Folklorico, MexNet Dinner, Screwtape Letters, UB40, Bollywood Masala, Neil Gaiman, Vietnamese Live, Hook movie, Les Ballets Trockadero, ASO Pops, Arlo Guthrie Peking Acrobats, Sweet Honey In the Rock, Vocalosity, Carol Burnett, Shen Yun, Star Trek Ultimate Voyage, Black Violin, Buick GMC Dealer Meeting, Legend of Zelda, and Mandy Patinkin. The arbitration hearing will take place on July 7-8, 2016. At this hearing, both parties will argue their case in front of the arbitrator. Based on the arguments presented, the arbitrator will make a ruling on the dispute. The arbitrator’s ruling will be final and binding. Local 205 will be arguing for our wages to be reinstated until the expiration of our current Agreement in 2017. Additionally, our grievance asks for all affected stagehands to be made whole, meaning that hands be compensated for their loss in income since September 2015. There is no guarantee we will win this grievance, but despite the financial cost to the Local, we feel that we must do everything we can to get our wages back. This entry was posted in 205 News, E-Board News, News, President, Representation and tagged arbitration, dispute, news, sa-inc-news, stage-alliance, wages on 07/05/2016 by 205admin. 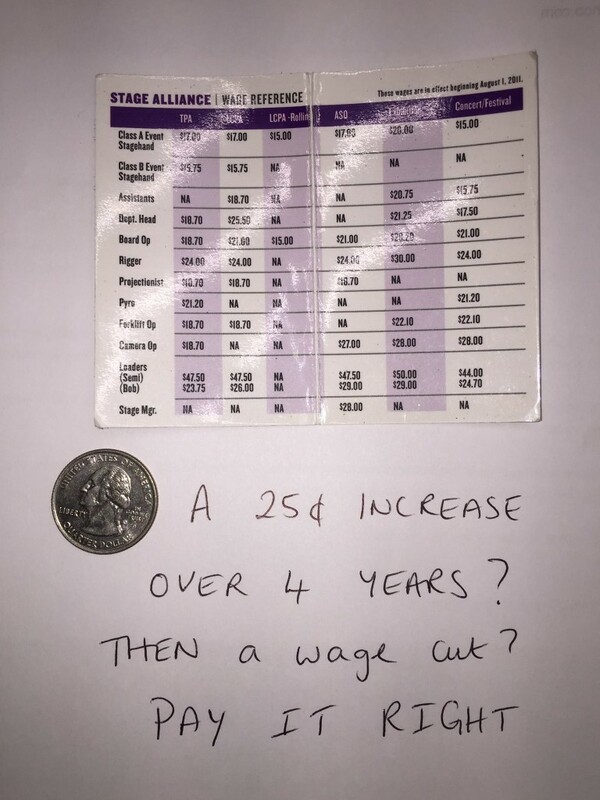 Wage Cut for Stage Alliance Hands! This entry was posted in 205 News, News, Representation and tagged agreements, bargaining, contracts, disputes, sa-inc-news, stage-alliance, wages on 02/28/2016 by 205admin. Stage Alliance Employee Meeting Today! Remember, you are a member of the bargaining unit that Local 205 represents!! Please check your email for further details about the subject, or show up and find out! Search for a message from “IA205 Info” as the sender, may have ended up in your junk mail as this was the first occasion to contact the entire bargaining unit via email. If you can’t attend, please sign up for the mailing list so that we can keep you informed! This entry was posted in News, Representation and tagged activity, bargaining, representation, sa-inc-news, stage-alliance, wages on 02/15/2016 by 205admin. A friendly heads-up from the Communications Committee. A couple of recent automated work requests from our Stage Alliance labor providing partner made their way to my gmail spam folder. Had never done so before, something may have changed that might cause this for others right now, check your spam, don’t miss work!